In this completely revised and updated edition of the breakthrough bestseller, neuropsychiatrist Dr. Daniel Amen includes effective "brain prescriptions" that can help heal your brain and change your life. You'll see scientific evidence that your anxiety, depression, anger, obsessiveness, or impulsiveness could be related to how specific structures in your brain work. You're not stuck with the brain you're born with. DANIEL G. AMEN, MD, is a clinical neuroscientist, psychiatrist, and brain imaging expert who heads the world-renowned Amen Clinics. The Washington Post called Dr. Amen the most popular psychiatrist in America, and Sharecare named him the web's #1 most influential expert and advocate on mental health. He is a distinguished fellow of the American Psychiatric Association and a nine-time New York Times bestselling author, including Change Your Brain, Change Your Life, Magnificent Mind at Any Age, and Change Your Brain, Change Your Body. He is also an internationally recognized keynote speaker and the star of several very popular public television specials. "With a cutting-edge, easy-to-apply plan, Dr. Daniel Amen proves you needn't succumb to depression, anger, and other negative emotions. 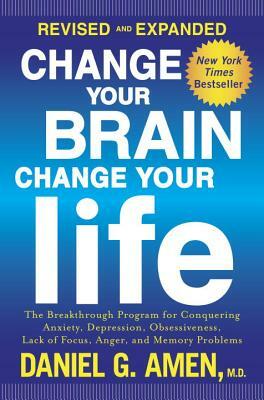 This must-read book provides the key to heal your brain and transform your life." - Mark Hyman, MD, Director of the Cleveland Center for Functional Medicine and the author of the #1 New York Times Bestseller The Blood Sugar Solution. "Revolutionary. Dr. Amen shows how your brain can become your worst enemy, and how with the proper treatment, your best friend." "Opens the door to assessment and interventions that can change your life." "Dr. Daniel Amen's book represents an expert solution not only for better treating brain illness but more importantly for creating a lasting state of brain wellness." "This book is a goldmine of practical and easy-to-follow instructions on how you can you can feel sharper, happier, and more in control. Dr. Amen has condensed his 35 years of experience in treating patients with attention deficit disorder, depression, anxiety, OCD, and addiction into a practical program you can follow on your own."